Now you are ready to learn watercolour painting by working from life. If you have done lots of experimental work and really enjoyed it, then you could be ready to paint that falling leaf from a mixture of memory and imagination and this is what you should do. But for those of us who feel diffident at this point the thing to remember is to keep it simple. The best thing you can possibly do is to start by painting an apple. Beginning with a watercolor still life is safer than many subjects. There are two things you have to do in your apple painting. One is to get the colours right. The other is to make it look solid. But the most important thing of all is your attitude. If you are worrying about not being able to do it or get it right, then this is what your painting will express. Judgement of colour and tone are things which come with experience and persistence. Therefore you just have to do it in the spirit of acceptance. Accepting where you are is the first step on the ladder. You have to paint with confidence - even if you don't feel it. There are two basic ways of painting watercolour, and the exercises you have been doing have been developing your skills in both. One is called 'alla prima' painting. It means painting in such a way that you get the final effect with the first brush stroke. The fire and earth paintings are examples of this. The other sort of painting is much more organised and consists of building up washes. The triangle painting is an example of this. 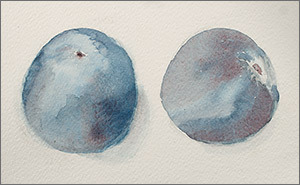 As you learn watercolour painting, good watercolour technique consists of doing both. You have to be both impulsive and organised. You should start by painting the apple in front of you as fast as you can - in 'alla prima' mode. Mix up colours as well as you can, put them on and don't worry if they run together. Think about celebrating the apple and enjoy what is happening. If the paper gets wet, you could try putting some very strong colour on the brush and touching it into the wet paper. This is called dropping in. Try to leave the light areas untouched; but don't worry if they get covered - you can always sponge them when they have dried. To analyse tone you have to look at the object by half closing the eyes. This exaggerates the difference between light and dark. In the fast painting which you have just done you had to make the darks by dropping in the darker colour onto the wet paint. The disadvantage of this is that it is very hard to control. It can move about anywhere and it can dry a lot lighter or with irritating watermarks in it. The way round this is to do a more organised sort of painting with built-up washes. It takes some of the frivolity out of it but keeps more control. The first three tones from dark to light have been laid in; now colours can be placed on top. The lighter tones can be lifted off with a dried-out brush. You can lift out the colour with a squeezed out brush in the areas where the colour is lighter, for example towards the top. This will give some very solid-looking apples. You can underpaint the dark areas of the apple in dark colours. If it is a green apple you can use a dark blue with a little green in it. If a red apple, then a dark brown. It will look rather horrible at first but when it is dry you can paint another wash over it with the mid-tone of the apple, green or red, and it will look much better. 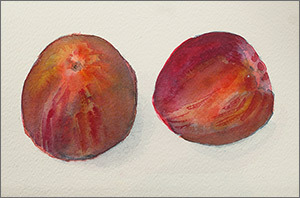 It will come with time as you learn watercolour painting, but the trick is to combine both methods of painting to give the form and colour of the apple.